Ranking among the rarest of artifacts on display at LSIM, this Jupiter system was produced in small numbers by Wave Mate beginning in 1976. 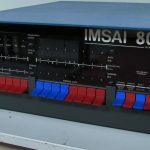 Better known for it’s Z80 Bullet SBC, Wave Mate produced the Jupiter series as an attempt to create a “universal bus” system that could support both 6800 and Z80 on the same backplane. Only a handful of Wave Mate Jupiter systems are believed to survive today. 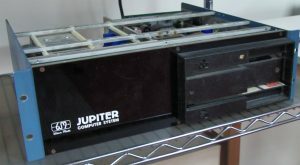 The one in this collection is believed to be complete, and also includes spare boards, software on disk, and source code for parts of the original Jupiter operating system. Vintage Computer Federation What happened to WaveMate?